I’ve never really been a monogamous crafter, I always have multiple projects going on. I like being able to pick up and put down projects as needed. If I’m stuck I like being able to put that project aside for a bit, or even if I’m not specifically stuck I can bounce from one project to another. Of course there are times when I like sitting down and focusing intensely on one thing. But even when I’m focused one project there’s always at least three or four other things happening in the background. The problem with this method of course is keeping track of it all. Most of the time I’m pretty good at it, there are lots of lists, and post-it notes involved, but generally everything gets done in a timely enough manner. Every once in awhile though something slips through, I’ll put a project down and forget to (for whatever reason) pick it back up. Which is exactly what happened with this shawl. I put it down because I needed to start the next chart, and then forgot about it. I thought I remember putting it down because there was some problem that I needed to rip back to fix, but I didn’t see anything when I picked it up to start knitting. Hope that doesn’t come back around to bite me. Either way, I started the third lace section last night, and am speeding along on it, falling in love the the colors, and the yarn, all over again. I even remembered to stop at the end of a row (something I never do) so that I could spread it out, rather than show (yet another) shot of a brown and purple blob. For more Work-In-Progress Wednesday posts, check out Tami’s blog. WIP Wednesday two weeks in a row? Crazy. 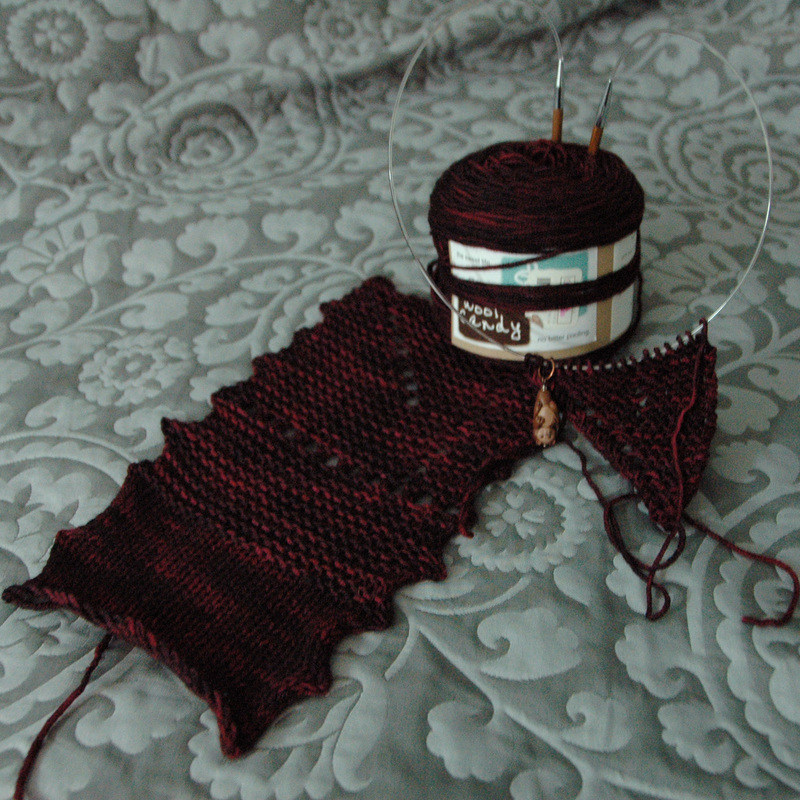 First off, I ripped the beginnings of the red shawl, but have yet to restart it. And so, the ball has been added back to the pile of projects waiting to be started. The pile is growing at an alarming rate. I’ve finished three sides, turned the corner and started down the last side of the border on my second Arrowhead Stole. If I don’t get distracted I could finish this week. If I get distracted, who knows (that pile of projects to be started is calling). 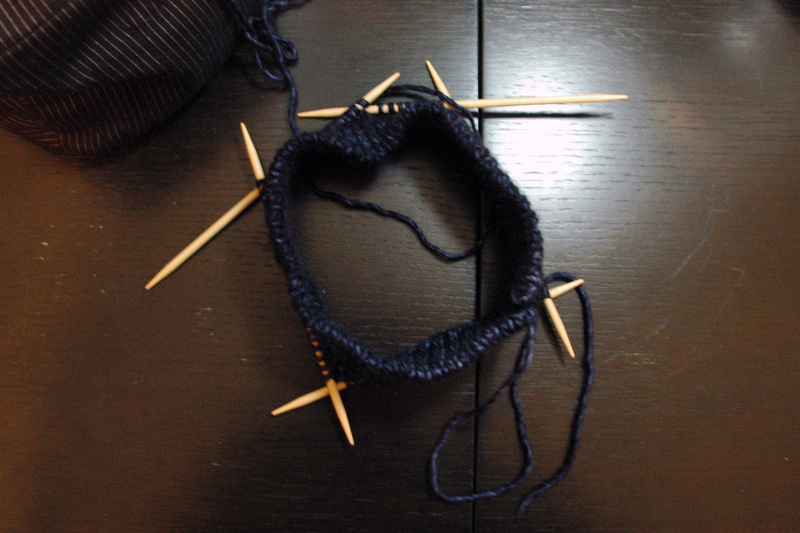 I (re)started a hat last night. I changed my mind about the original cable design and had to cast on again with fewer stitches. But now I’m rethinking this version and I haven’t even started the pattern yet. Fingers crossed I don’t have to restart again, but we’ll see how it goes. This has been getting most of my attention this past week. A couple stripes every day and I’m now almost done with the diamond panel. (Not that you would know that there is a diamond panel from this picture, let along that I’m almost done with it). I have to see if I have a longer needle. 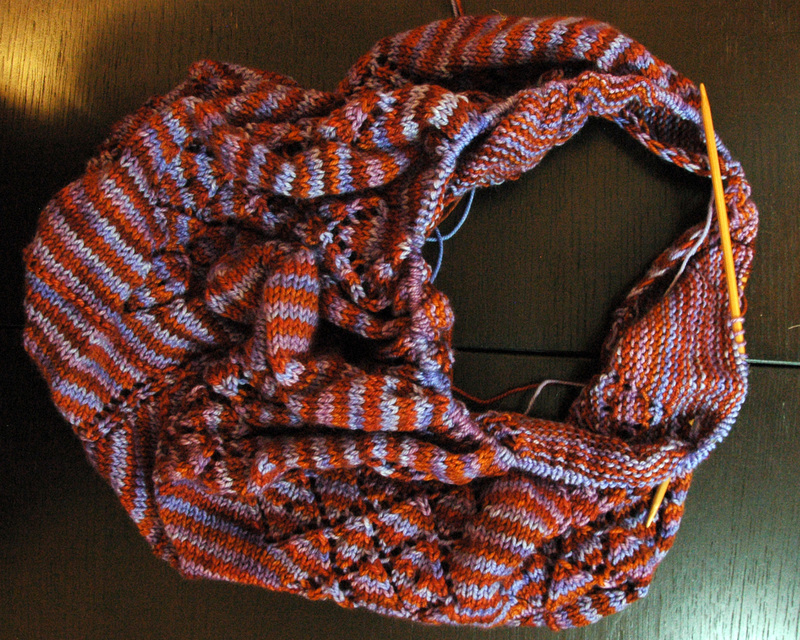 If so, I’ll transfer the shawl and try to remember to snap a photo of it spread out. For more WIP Wednesday, check out Tami’s blog. I have works in progress to post about, and it’s Wednesday, which means I have WIPs for WIPs Wednesday. Possibly for the first time ever. 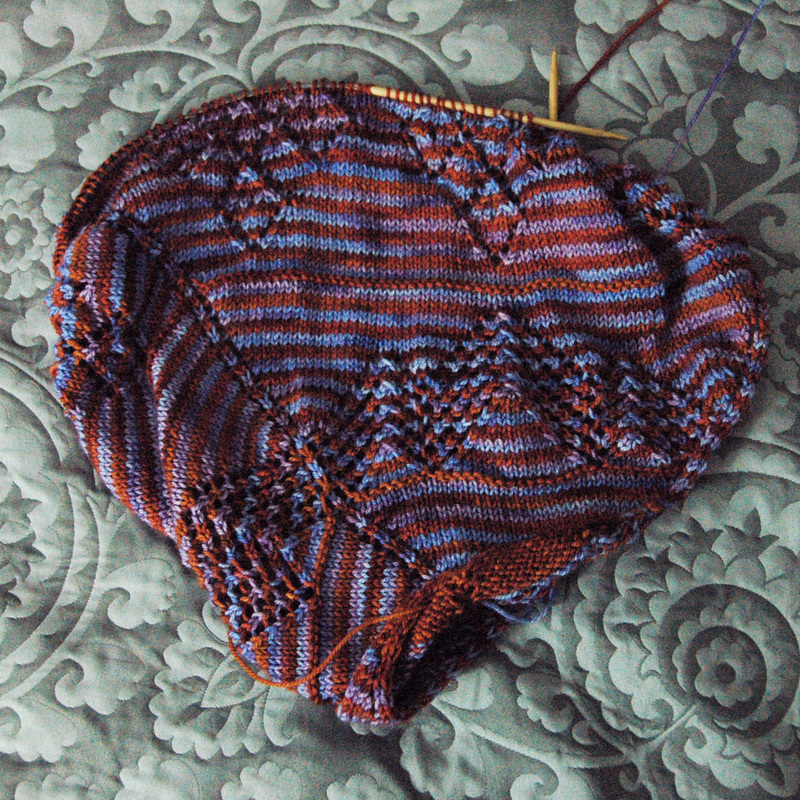 Three things on the needles at the moment. One closer to done than not. One coming up on the middle, comfortable established, but still newer. And one that’s just a baby, which I need to restart tonight or tomorrow. I’ve shown this blob of blue before. 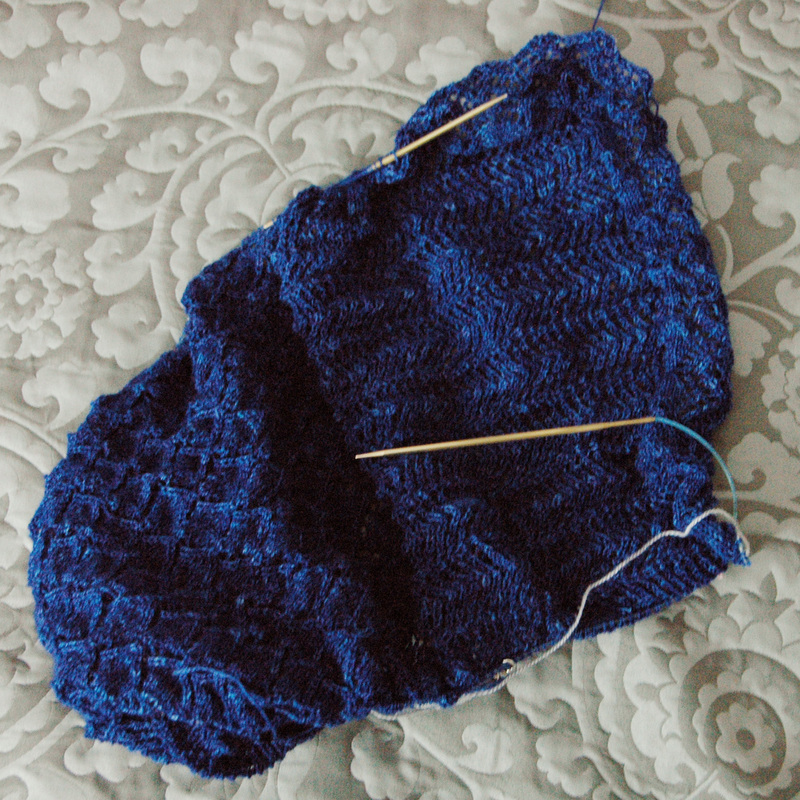 I’m knitting my Arrowhead Stole pattern, out of tosh lace in lapis, on 3.00mm needles. I powered through the last section of the main body, picked up stitches all the way around and started the knit on edging over the weekend. 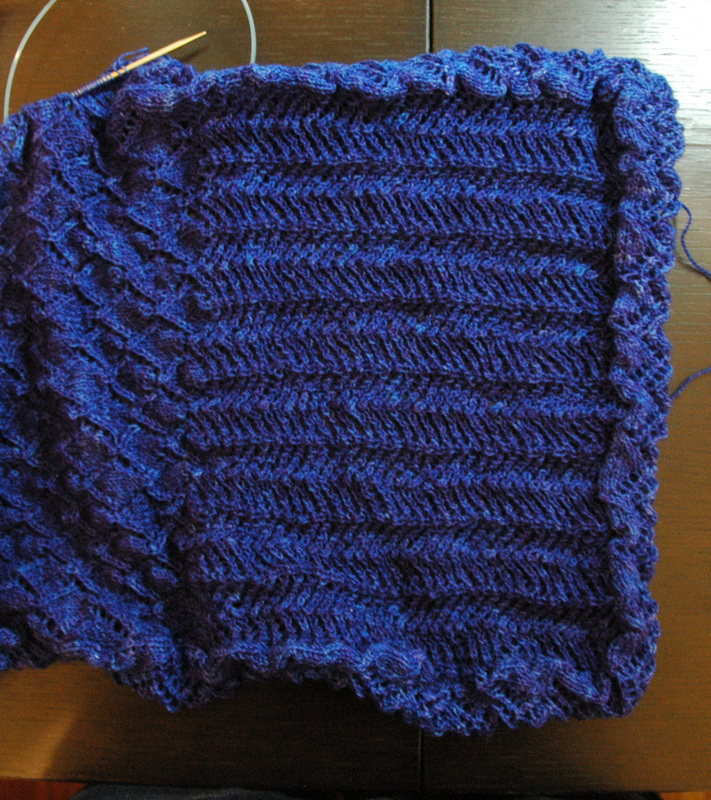 Now I’m a couple repeats past when this photo was taken, so I’m about a third of the way done with the second side. Maybe I’ll be able to finish this side this week and start on the third. This is a newer project, but is already starting to bunch up on the needles, that’s what I get for working with thicker than lace weight yarn. 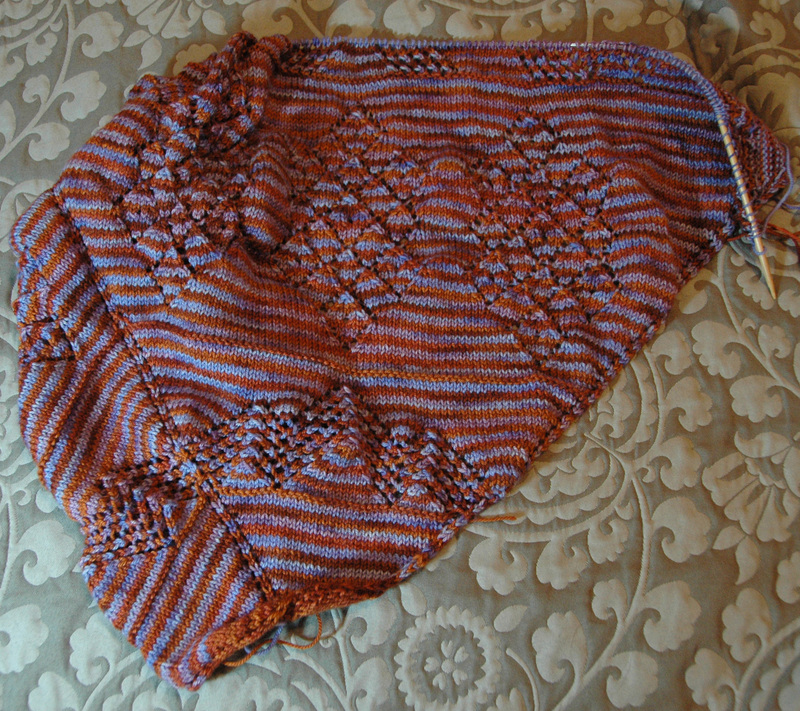 It’s a top down triangular shawl knit out of Prisim’s Saki yarn in Periwinkle and Copper Penny. The photo in no way does the colors justice, they’re beautiful together. I’m doing a two row stripe sequence that shows off the colors, much like in Malus domestica, but in this shawl I’m also incorporating lace elements inspired, in part by Arctic Lace, and the geometric lace included in that book. I started this last night, but think I need to rip and restart. It’s an asymmetrical triangularesqu shawl, and I don’t think I hit the shaping on the head this time. Ah well maybe tomorrow.